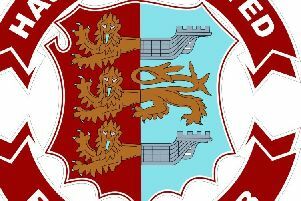 NIGEL Kane has described Hastings United's visit from struggling Corinthian Casuals as a "must-win" match. Hastings need to beat the second-bottom Surrey outfit on Saturday January 14 to boost their hopes of coming up on the rails in the race for the play-off places in Ryman Division One. "We have to beat them, there's no getting away from the fact that it's an absolute must-win game for us because that can provide us with the springboard to push up the table," said Kane - one half of the Hastings managerial team with Pat Brown. "They scored three goals last week but it just shows how weak they are in defence because they conceded four, so if Walton Casuals can score four against them then I'm confident we can score against them. "We can't underestimate them," he went on, "but we've got a few more options because Duncan (McArthur) and Ade (Olorunda) are back and probably for the first time in our tenure Pat and I have got a few selection problems and for the first time the team won't pick itself. It's a case of Pat and I coming up with a winning formation." Kane will go into the match intent on keeping a clean sheet to follow on from a 2-0 win over Ashford Town and a goalless draw at Horsham. "If we keep a clean sheet I'm sure we'll win the game. Corinthian are frail at the back, they concede goals and we have got to take advantage of their frailty." As well as McArthur and Olorunda returning to the squad after suspension, Hastings are hoping to be boosted by the availability of Jimmy Elford. Elford has recovered sufficiently from a mild case of glandular fever to attend training and would have played a minimum of a half for the reserves against Crawley Town yesterday had the match not been postponed. Danny Spice is "raring to go" despite breaking his nose at Horsham 11 days ago. "The thing with Dan is he is as hard as nails," Kane said. "He'd run through brick walls for you. You need players like that in the team."